Earlier this year, we landed a great opportunity to help rectify a problem in one of the exhibits at the California Academy of Sciences. 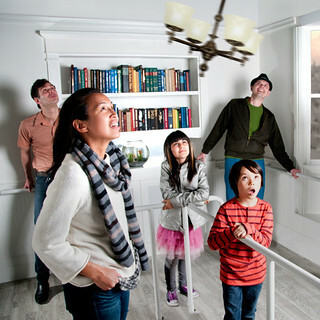 Within the “Earthquake: Life on a Dynamic Planet” exhibit is The Shake House where visitors can experience what it was like to be in the dining room of a San Francisco Victorian house during the Loma-Prieta earthquake of 1989 and the Great San Francisco earthquake of 1906. The room shakes, complete with books on the bookshelves shifting, plates rattling and the chandelier swinging. 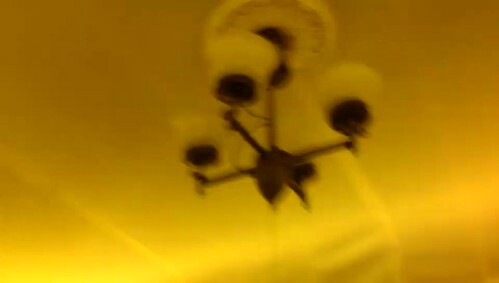 Unfortunately, the chandelier was swinging too much and beat itself up as well as damaging the ceiling of the room. It had originally been designed using small vibration dampers that didn’t last long after the exhibit opened. The Academy staff tasked with maintaining the exhibits had made a number of repairs but they haven’t lasted and maintenance was becoming too time-consuming. Our directive was pretty straight-forward – fix the chandelier so it still swings naturally but in a more controlled manner. They were OK with a solution that required routine maintenance as long as it was a quick fix. We knew that the challenge was great given the space constraints and the fact that the chandelier couldn’t look like a science experiment inside of a dining room. With that said, we decided we could do it. When they agreed to our plan of action, we began designing in earnest. It quickly became apparent that the challenge might be greater than we had anticipated. The bottom of the chandelier hangs down about 18 inches from the ceiling and weighs between 10 and 15 pounds. The shake room moves side to side with about 1 G of acceleration. This translates to a pretty violent action if that movement isn’t controlled. The space to control the movement at the ceiling was small since the cover plate was similar to what would be found in any house. When brainstorming we went down two paths. The first was follow suit with the original design and constrain the motion. To do this the chandelier still needs to move naturally but not to much. 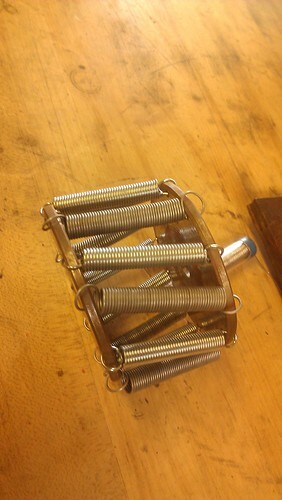 Rubber bumpers, springs and friction mechanisms were considered as possible solutions. The second path was to dampen the motion, absorbing the energy of the swinging chandelier. Industrial shock absorbers and magnets were considered in this idea of thought. 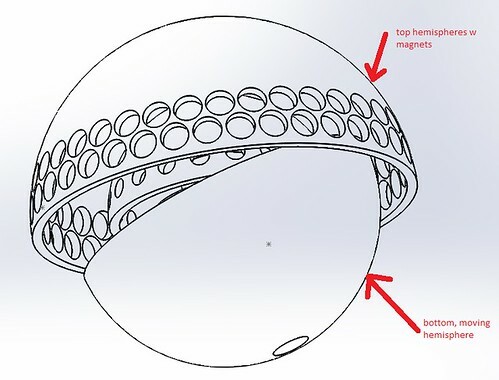 One of the early ideas pursued was to make an eddy-current braking mechanism and we quickly designed a system of magnets in a compact sphere that met our space requirements. The engineering data for such a device is difficult to come by so we found the strongest magnets that met our size criteria. Early tests proved encouraging but when we installed it on the actual chandelier it was clear the chandelier induced far too much torque for the brake to be effective. Given that the schedule was also important, we abandoned the eddy current brake but pursued another avenue using the magnets. Round 2 of our mad-magnet-experiment involved rearranging the magnets in two opposing hemispheres so the magnets in each repelled the other. The idea here was that the magnets would constrain motion but in a non-contact scenario. 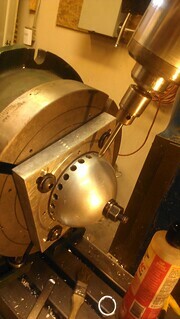 Once again, the massive torque created by the swinging chandelier was too much for the magnets to counteract. It was time to take a step back and ask ourselves what to do next. Remembering that the Academy had some success with constraining the motion with different methods, we decided that may provide the quickest path to a solution. So we devised a new design idea of encapsulating the universal joint in rubber. The u-joint was part of the original design and allowed the chandelier to move while rigidly mounted to the ceiling structure. As noted earlier, the original creators used vibration dampers to limit motion and those apparently failed pretty early on. The Academy staff also tried to insert rubber around the u-joint to limit movement but it didn’t last long and required quite a bit of maintenance. This is where Independent joined the team. 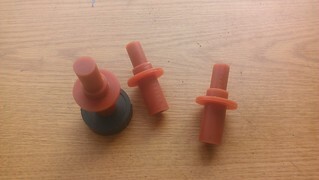 Since off-the-shelf rubber solutions did not last long enough, we decided that a custom rubber solution was required and that the entire u-joint would need to be encapsulated. Consulting with a urethane supplier, we found a resilient material that we could pour into a mold allowing us to make whatever shape we wanted. Patrick quickly machined a piece of wax that was the same shape as the u-joint. 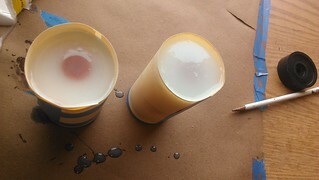 We then surrounded the wax with a cylinder and poured the urethane around the wax mold. 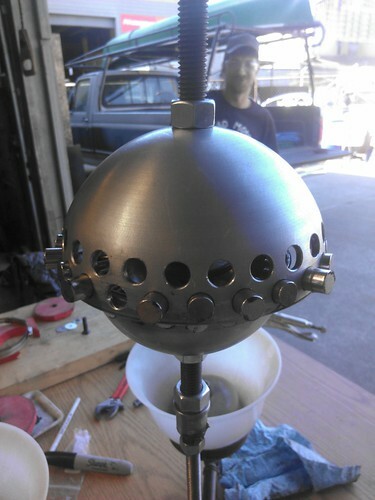 One day later, after removing the wax center, we slipped the new urethane sleeve around the u-joint, clamped a stainless steel band around it and gave the chandelier a violent shake. Success. Next step was to make a test run in the earthquake room itself at the Academy of Sciences. This test proved successful too so we left it in place with a plan to check it in 30 days. 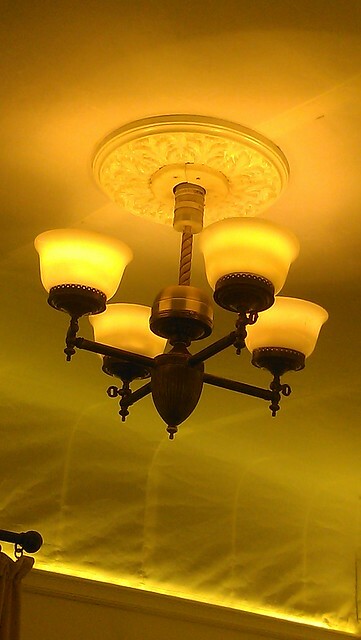 One month later the urethane sleeve did not show any wear after 30 days of continuous shaking and the chandelier was still shaking and swinging, just a little but not too much. If you are in the Academy, check it out!